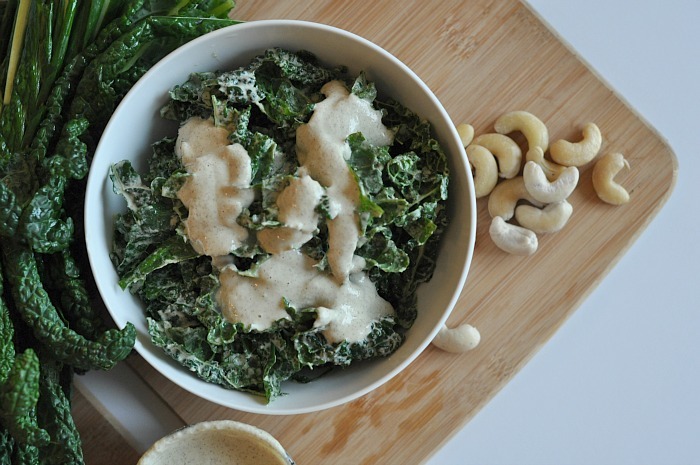 If you tried our Cashew Caesar dressing, you will love this raw vegan kale Caesar salad! I’m really getting a kick out of making dairy free substitutions that actually taste like the real deal, and our dairy free Caesar salad dressing from last week is a huge hit. To show you how to use it in a recipe now, I’ve decided to make a classic Caesar salad with dinosaur kale. I prefer to use dinosaur kale when making salads vs. regular ole’ kale because of the texture. Dinosaur kale is a bit more pliable and not as rough to chew on raw, but still packed with nutrients like Vitamin’s K, A, and C. It’s also packed with flavonoids, anti-inflammatory properties, and has cancer fighting compounds. This recipe is ridiculously easy to make (as most salads are), and takes no longer than 10 minutes to toss together. Make your vegan dressing in bulk so that you can save even more time with your recipes throughout the week as well. I also like pairing this salad with one of my vegan soup recipes like our warm tomato bisque, or the vegan version of a classic minestrone. Since the dressing is so “rich” it makes for a beautiful comfort food dinner – that’s healthy! 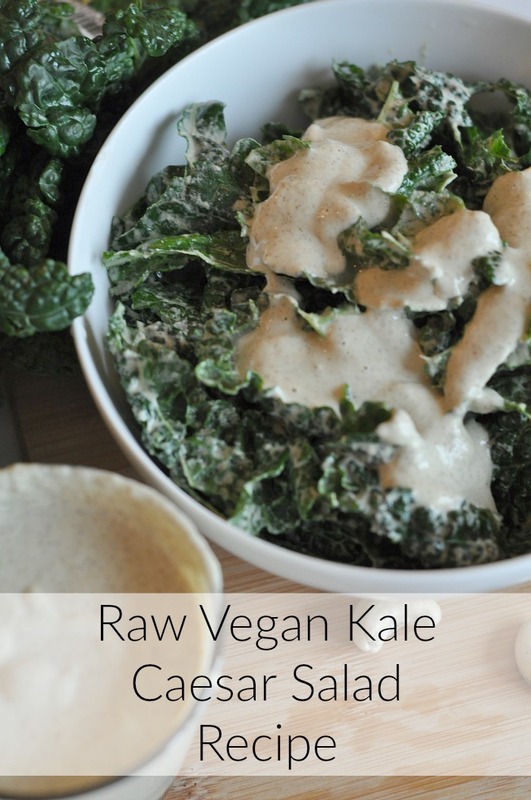 In a mixing bowl, toss together the washed and dried kale and dressing. Add the nutritional yeast, and toss again. If you want to add a protein to this salad, you can add a 1/2 cup of drained and rinsed chickpeas. I like eating this salad with the three ingredients only because the dressing has such a punch of flavor that not much else is needed!